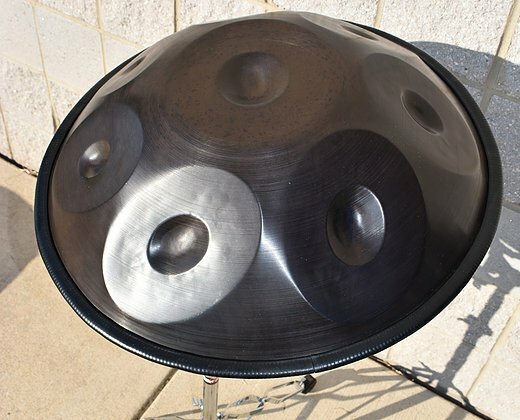 MEINL Sonic Energy Harmonic Art Handpan instruments are hand made one at a time using top grade German steel. This material has been chosen for both its ability to be worked by hand and its strength to hold the tunings. These instruments are built to last a lifetime. The Harmonic Art Handpan produces clear and pure notes when struck by the hand. The tone is pleasing, soothing, and relaxing and can be used in a variety of settings both for performance and therapy. Each one is tuned with a center note and seven additional notes allowing the player to work within a musical scale both as a solo instrumentalist and with a group. Model HD3 tuning: D#, G, A#, C, D, D#, F, G and comes with protective cover and carrying bag. List: $ 3300.00 OUR PRICE: $ 2490.00! DISPLAY MODEL HAS SEVERAL SMALL SCRATCHES OUR SPECIAL PRICE: $ 2399.00 with FREE SHIPPING to Continental U.S. Addresses.